One of my friends is getting back into imaging after a few years doing other things during which he forgot a lot about processing. To help him get back up to speed I've been building a rather terse guide to processing. I know, I know. It seems like every imager eventually ends up putting together a tutorial or guide. It's not like I'm a keeper of the Secrets of Imaging. I'm stretching credulity to call myself an intermediate skill level imager; it's a joke to use my name and APOD in the same sentence. You get the idea. There's nothing like writing things down to demystify them and perhaps once and for all learn them. I started by outlining my usual slap-dash processing workflow, and now I'm improving it with some better processing methods and tools I've found roaming the web. This is a proverbial work in progress, so it will grow in time. So far I've only worked on one-shot color and RGB three-channel imaging, but I hope to add some LRGB information shortly. To give you a look at what some simple processing can do for an image, compare this image of M51 processed in April with an improved version making use of a few of the things I've learned. Lots of excuses: The data here are poor, there were only dark and bias frames for calibration, the telescope was very badly collimated. The left image gives you an idea of where I was at only six months ago--it was the best I could do. 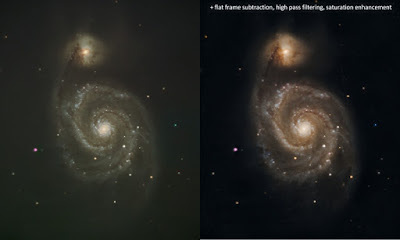 The right image employs a synthetic flat created by applying median filtering, Gaussian blurring, and masks in Photoshop CS5. Also applied is a high-pass filter, but it doesn't add much because I had already mucked up the image with an Unsharp Mask. Lastly, flatting out that icky background has allowed me bring out the colors that had been hidden. That was done with curves in lab mode. It's far from perfect--that strange magenta star to the left of the galaxy vexes me--but it's a light year or two better than it was. What I lack in processing skills I counter with determination: I've finally bested the Astronomical League's Bright Nebula Observing Program (imaging option) and have been awarded certificate #9 (advanced). I ended up imaging 103 objects. Some of those images are going to get reprocessed in light of my improving skills. A Big Night for Arps / A No-Show Star Party.